Cornelia Funke didn’t like fairy tales as a child. I’m just about with her on that. I did read them, possibly even liked them, but when you think about it, there isn’t much to actually ‘like.’ Is there? 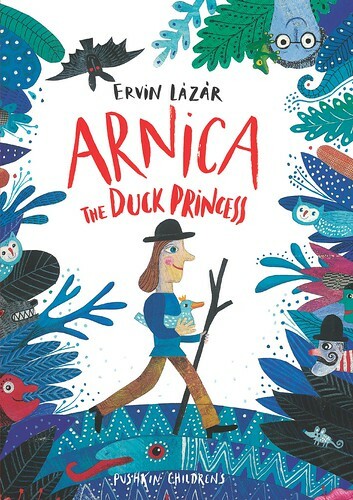 As Cornelia points out in her introduction to her new collection of classic – but less well known – fairy tales, children are less sensitive than us adults tend to believe. I hope that is true, because there are some gruesome stories here, along with some lovely ones too. I wasn’t really planning on reading all the tales in Through the Water Curtain. But with one thing and another, I discovered I was sitting there, reading one story after another. So much for that. But I did actually skip one. It was too gruesome for me, adult though I am, and everything. I permitted myself to leave that particularly bloodthirsty and unpleasant tale right where it was. No doubt someone else will find it and enjoy it. This is a gorgeous volume, with a cover that I have found myself stroking repeatedly, all in blue and green with gold. 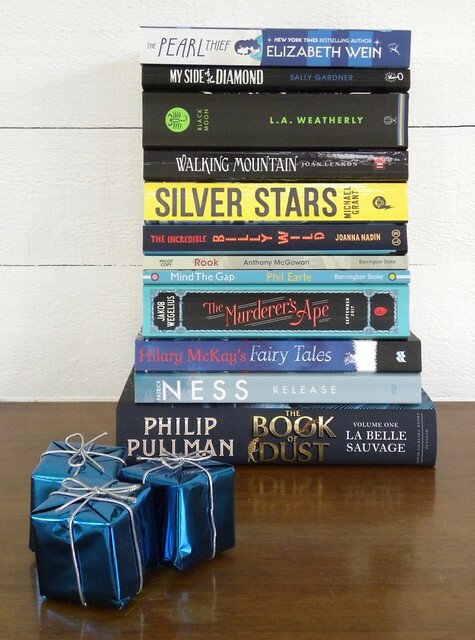 Anyone would love to receive one of these for Christmas. As Cornelia points out, women get a raw deal in fairy tales. There are so many silly young princes and their father the King, and far too many females quite content to marry the cleverest young man, no questions asked. The pattern of these stories is much the same as in all fairy tales. With one or two exceptions, however, they are mostly new, to me, and to many westerners. 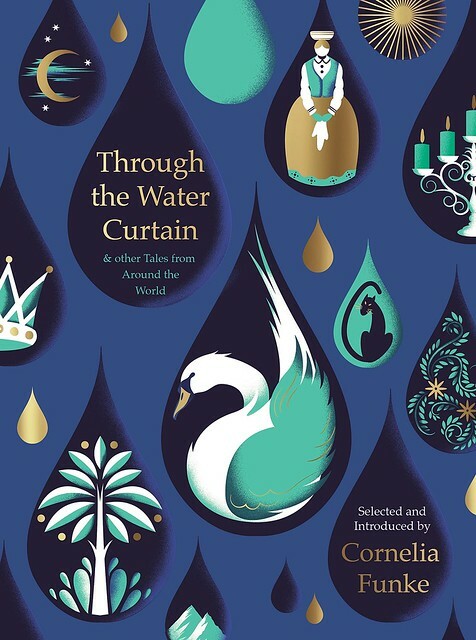 Cornelia has long collected tales from all over the world, and in Through the Water Curtain she offers readers plenty of new material. 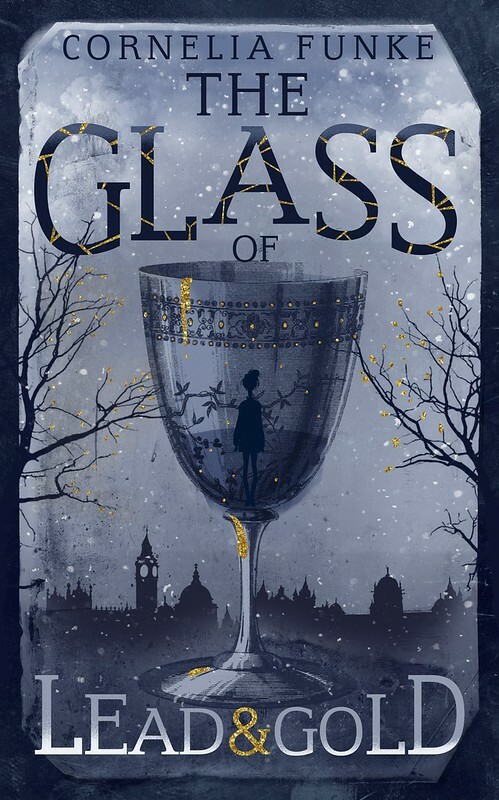 Cornelia Funke’s The Glass of Lead & Gold is that best of things, a beautiful, small volume consisting of a Christmas story that can be read at any time. Written in English and illustrated by Cornelia herself, it is set in her Reckless world. In an alternate, past London, we meet Tabetha, an orphan trying to survive by searching for ‘treasure’ in the Thames mud. Just before Christmas she’s asked by a stranger to look for a sliver of glass. A specific sliver, for which he will pay well. There is a ‘soup kitchen’ and a troll, as well as a one-armed waitress, and together they work some Christmas magic. 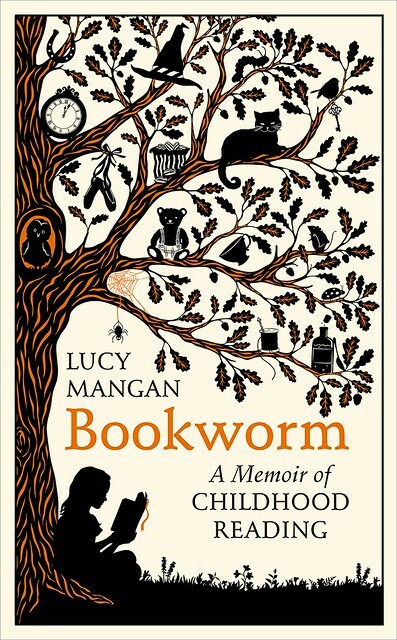 I reckon anyone would love to discover this in a stocking, or to have it to read in the months leading up to Christmas. It’s small and could lead to better things, just like the sliver of glass. There are good witches. You knew that. 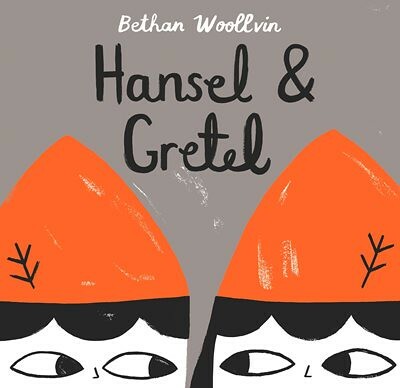 In Bethan Woollvin’s Hansel & Gretel we have the traditional fairy tale turned on its head. The witch is kind. The children are naughty. This actually makes for a fun story. It makes you think. Those children run amok, until the witch doesn’t know what to do. Well, she does. Really. Wonderfully different illustrations in white, grey and black, with orange. I rather envy Sophie Anderson her grandmother. 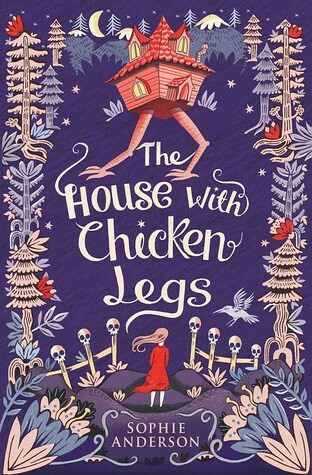 Without that grandmother, we wouldn’t have had this quirkily titled debut novel, The House with Chicken Legs. But I can see that even without this marvellous story, Sophie’s Prussian grandmother would still be worth having. She was the one who brought with her, as one of very few belongings, a book of fairytales as she left Europe after WWII to settle in Wales, which is where she introduced Sophie to Baba Yaga. A house that moves, and on chicken legs no less, felt vaguely off-putting at first. And I’ve never been sure of this Baba Yaga person. But I also knew I needed to read the book. In a way this is your traditional tale of a child who wants something very much, disobeys old rules, causing something unexpected, and worse, to happen, and having to learn to live with the consequences. Well, I’m not saying any more. This is a warm and different story about finding yourself, and also about standing firm when you feel you must do something a bit different. And all that food! I blame Sophie’s grandmother.